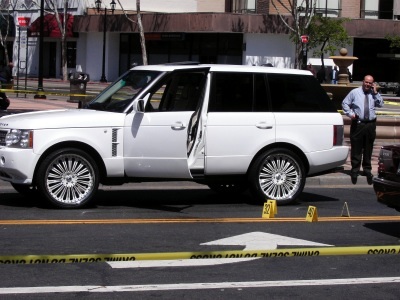 An apparent attempted carjacking on Monday morning, April 7, 2008, ended with the shooting death of the victim who was being carjacked. 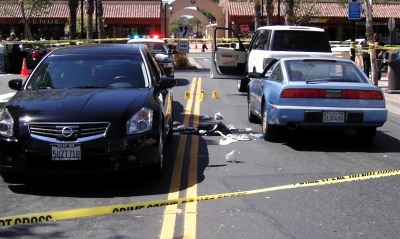 The incident unfolded in the parking lot of Washington Plaza near the intersection of Estudillo Avenue and E. 14th Street. The suspect escaped a police manhunt that focused on the area near the intersection of Marina Boulevard and San Leandro Boulevard. Police were unable to locate the suspect. The driver of a white Land Rover, who was the apparent target of the attempted carjacking, was taken to Eden Hospital, where he later died. This is the first murder in San Leandro since December 23, 2006, when two people were shot and killed at the Lucky Star Lounge on Doolittle Drive.